Giveaway: Naturai Personal Salad Maker NSM1501 from Mayer! Exciting news! 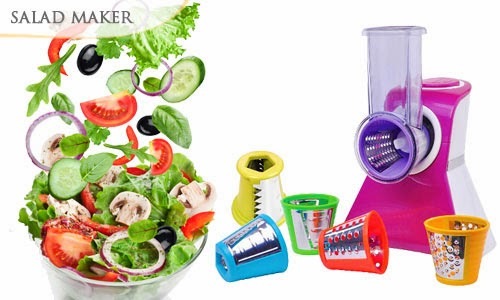 We are giving away a Naturai Personal Salad Maker from Mayer, model number NSM1501, a handy device that helps you to prepare a whole range of thin and thick sliced and shredded vegetables. It comes with 6 shredding cones, for everything from crinkle-cut french fries, to hard cheese, fine shredding, coarse shredding, thin and thick slices. 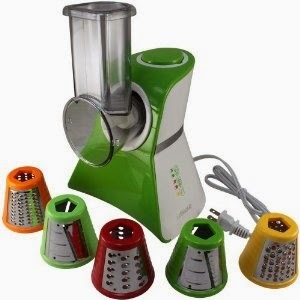 These can be used to quickly prepare salads that include vegetables, cheese, meats or roots. I can imagine that this is great for popiah, Chinese New Year pen cai or yu sheng. It is also easy to clean and safe for (older) children to use. This item is worth $120 and is a stock piece sponsored by Mayer, meaning that the box does not look perfect and it has been opened for testing (by myself, once) but is unused and otherwise brand-new. Mayer provides a one year warranty for their products. I've attached the spex sheet here. To win, all you have to do is leave a comment or link to your favourite salad recipe or current favourite place to dine out in Singapore . We will close for entries on the 31st of March. The item is for self-collection, in Singapore only. We had been meaning to try Morsels at Mayo Street for a very long time and this Friday, we decided to take a spontaneous trip there. Much has been written about this place and so I'm just going to concentrate on the food. The location is a lovely old shophouse, one side has been fitted out to be a steel kitchen and wood bar and the other casual tables with mismatched furniture and comfortable barstools at the counter. The general feel of the place is casual and unpretentious, much like their earnest and friendly co-owners, Brian and Petrina, who are behind the kitchen. A staff of perhaps 10 buzzes around the galley kitchen and bar, preparing and serving dishes, not quite with the masculine velocity of Burnt Ends, but definitely with purposeful and unintrusive confidence. We decided to leave our selection of small plates to the chefs and just sit back and soak in the night. We wound up tasting about 12 plates, cycling through half the specials and menu-featured small plates. To start, we had the limegrass mojito and a Hokkaido scallop cerviche with compressed plums and tobiko with home-made tortilla chips to start. The menu is based on small plates, Western concepts with Asian-inspired ingredients and this seems to be working really well. I was very encouraged to see that there was a great mix of demographics and age in the restaurant, and despite the slightly smoggy day and difficult Little India evening traffic and parking. Too often, restaurants in Singapore are not equally supported and attract a clientele that is either highly specific, or aligned to the chef/owner's ethnicity - rather like how Travis Masiero's Luke's is always white and Willin Low's Relish is always well, Asian, so I was especially happy to see that this wasn't the case here. Of the first three plates, I really enjoyed the home-made tortilla chips- just the right combination of crispness and puff, basically the kind of flaky pastry that would taste good with just about any dip. I felt the cerviche was a little too sweet with the plums, I would have liked to taste more sharpness, to contrast with the smooth mellowness of the scallop and more tobiko for crunch. 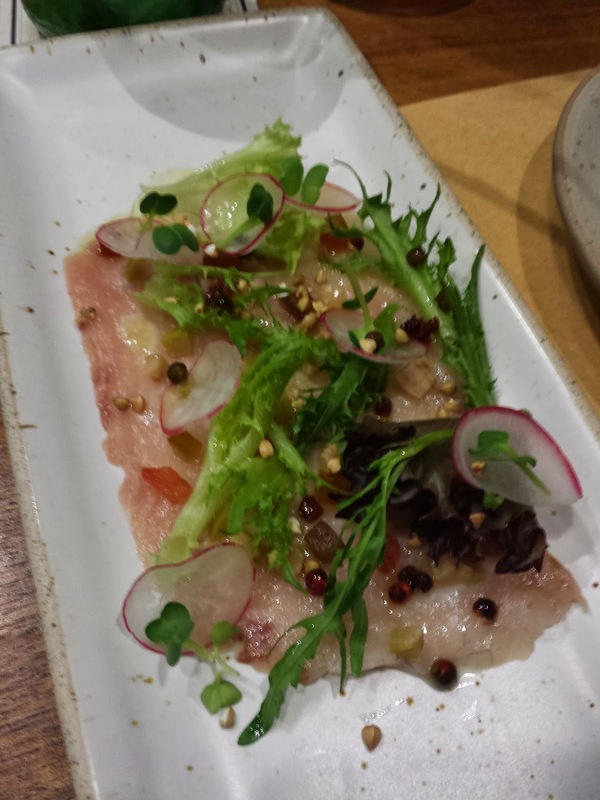 I also really enjoyed the hamachi, with green manzanilla olives, shaved baby radish, radish sprouts, buckwheat, argula and heirloom tomatoes. Their yuzu ginger dressing tasted of juniper berries and softened black pepper- it was complex and really tickled your palette. This was one of my favourite dishes. Another was the third plate, also on the specials, the mesclun with compressed green apple, jamon, candied pumpkin seeds and creamy burrata, served with a simple salt-and-pepper toasted crostini and with a raspberry-balsalmic reserve. Simple and delicious. 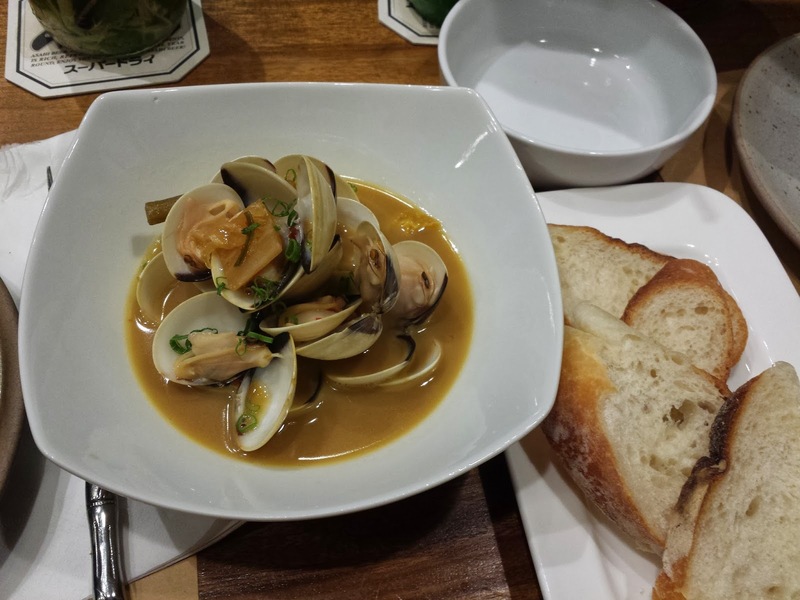 The next dish was the littleneck clams, cooked in a miso broth and with home-made kim chi. Despite Z's protestations that he could taste the butter in the broth, I liked it, it was rich with a good kick and I appreciated the clean and opened clams, with the spice of the kim chi just making the dish outstanding and different. 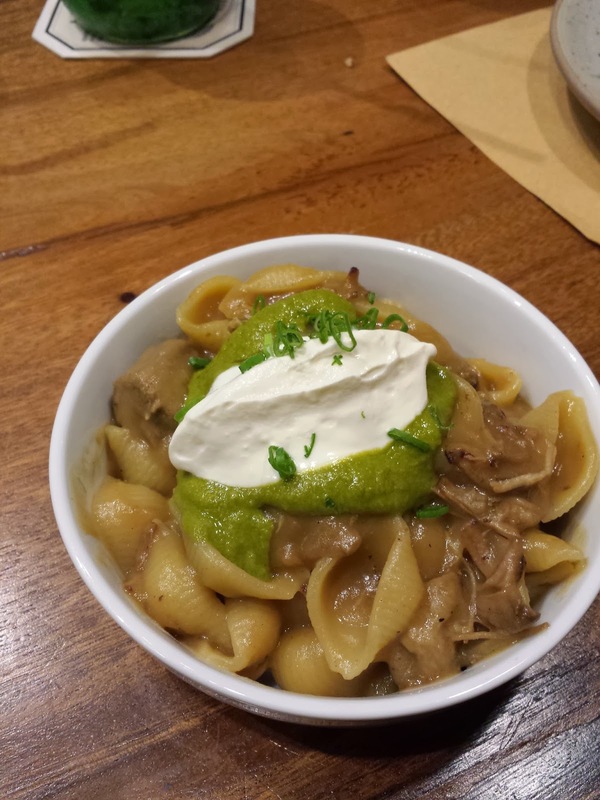 The fifth dish was the pork pasta, served with what tasted like a green curry and sour cream sauce. This was probably my least favourite dish, the pork was a bit stiff and mixing the sour cream in actually made the dish very heavy, if filling. 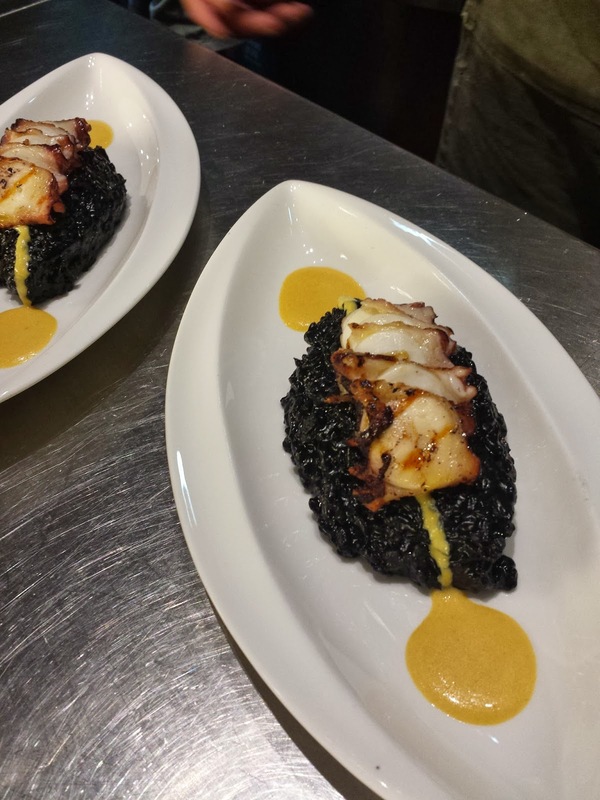 These were the first of the pasta dishes, the sixth was a black squid ink risotto, with octopus that had been poached for three hours in dashi, then grilled, sliced and basted again with dashi. This was drizzled over by salted egg yolk and topped with ikura. 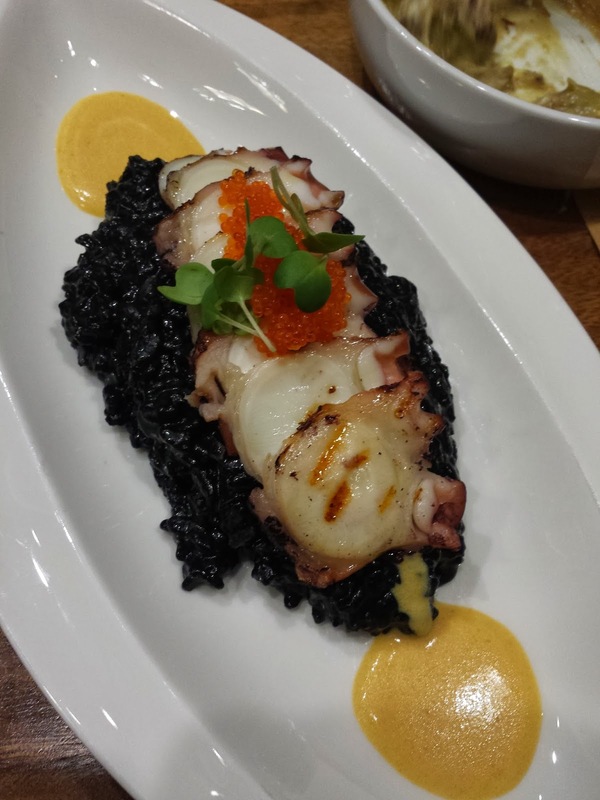 This dish is actually really in sync with what Morsels is about, the use of unlikely ingredients like the salted egg sauce, which was delicious and the octopus which was sweet, soft and charred. I also appreciate the little touches like the microgreens, the Japanese fish roe and sour plums and the edible flowers that garnished the plates. In some restaurants I feel that the cooking doesn't live up to the garnishes, but here I felt the attention to detail and the quality of food preparation did. This was also the point at which I started to feel quite full and would have been happy to move to desserts, but the guys I was eating with were still able to eat and we hadn't yet moved on to the meats. 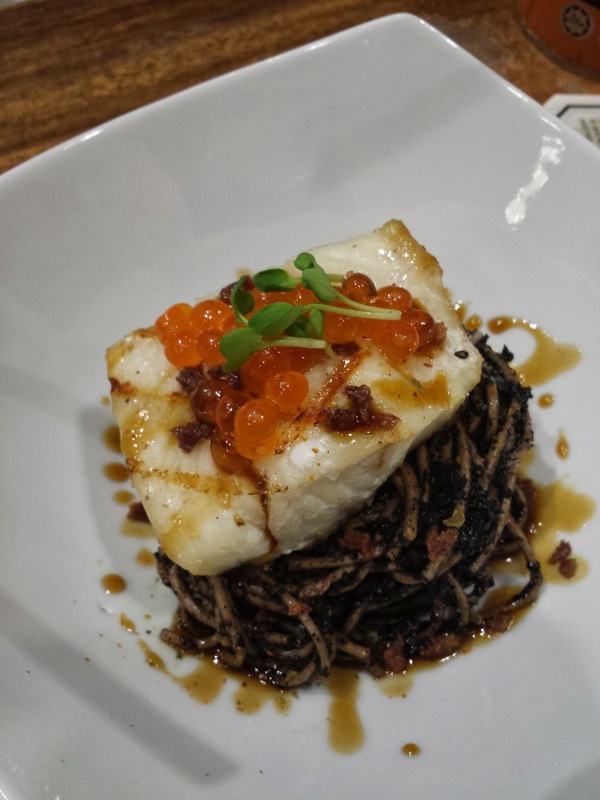 The seventh dish was a nori pasta with Alaskan Ling Cod, topped with ikura. This is a special item, as opposed to a regular menu item. The chef told us that a new menu is currently in the works, so that is definitely a reason to return. This was my second not-favourite dish of the night, while decently executed, the fish wasn't flaky the way you expect cod to be, it was still a little turgid and too solid (as you can see I suspect, from enlarging the side of the fish in the photo below). The pasta was flavourful- the seaweed pesto is made by mixing nori with basil, pinenuts, sesame and olive oil in the regular combination but somehow the pasta was a little stiff and the taste of the nori also came out slightly bland, I think I would have preferred something saltier like Chinese black olive. The eighth dish was a grilled pork cheek. I think you can see from the photo below how marbled and well-seared it was. This was very good, but so marbled that it crossed the line from flavourful into fatty. I would probably have used a pork cheek jowl with paradoxically a little less fat, marinated it with rum and raisins to give a sweetness and served it with a sharp mustard to cut through it. But I'm splitting hairs here, it has to be good enough to inspire you, which it was and most, if not everyone, would have found it just fine the way it was. 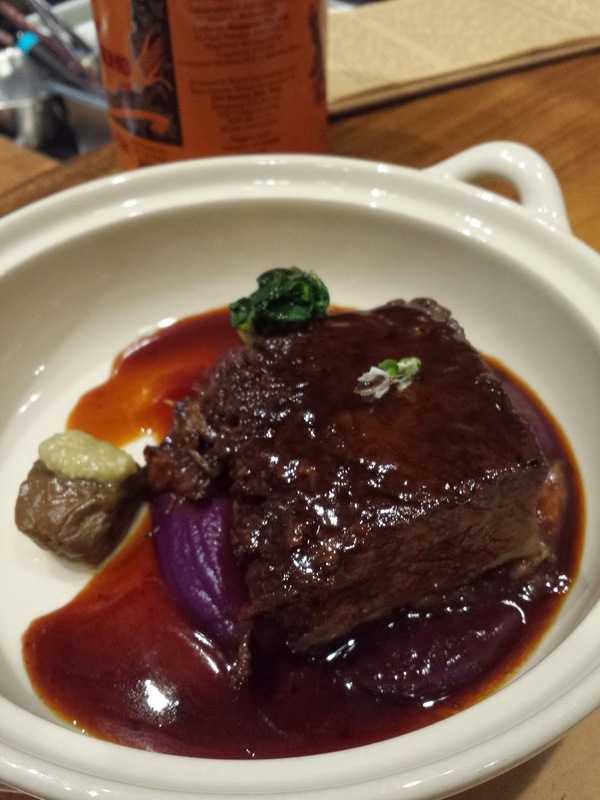 The prettiest dish to me, was the ninth dish of braised beef short rib. This was grilled and then curiously, it was sous-vided at 78 degrees for part of the duration of our meal. I didn't understand how it was so tender- having sous vided meat, I know that it can't be done in such a short period of time, but it hadn't appeared to be pre-cooked. Part of the magic I guess! 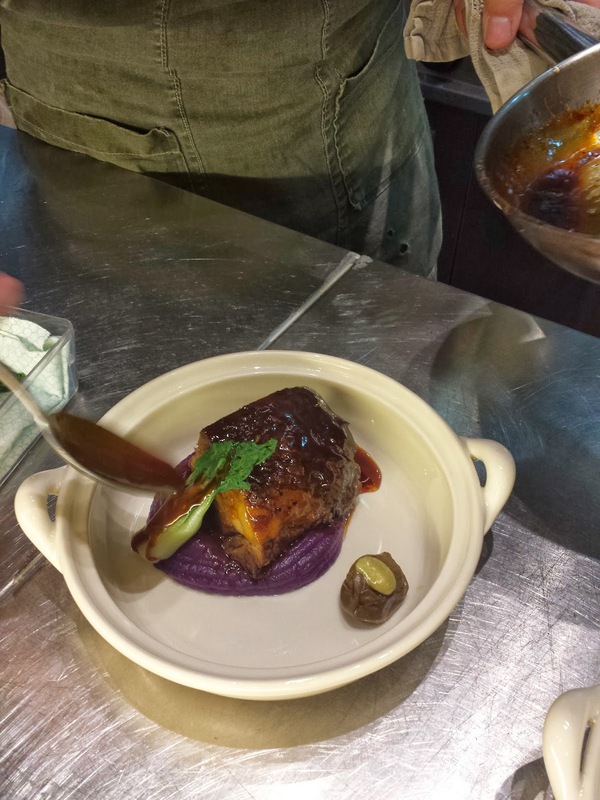 It was then removed from the sous vide and braised in a pan, basted and glazed with the gravy and sat atop a bed of purple Okinawan sweet potato. It had never occurred to me to use sweet potato for such a purpose, let alone a purple one and I could see from it's vivid colour that it had also been sous-vided and not cooked or roasted. That's a lot of trouble to go through for the visual appeal of a dish and this was beautiful and delicious to boot, with the meat cutting well under a knife. The meat was supple, yet soft and flavourful. It was totally finished by the guys. There were other meat dishes on the menu which we didn't get around to because we were already full and it was getting late. We'd stayed at the restaurant almost two and a half hours and I was quite amazed for for a small place, they had the dedication and gumption to go with such a diverse menu, which required serving multiple small plates at each table. For dessert, we had the Morsels Signature Milo Tira-miso ($12 for a small and $16 for a large jar) and a Bluberry and Apple Jam Cheesecake, which was on the list of specials. 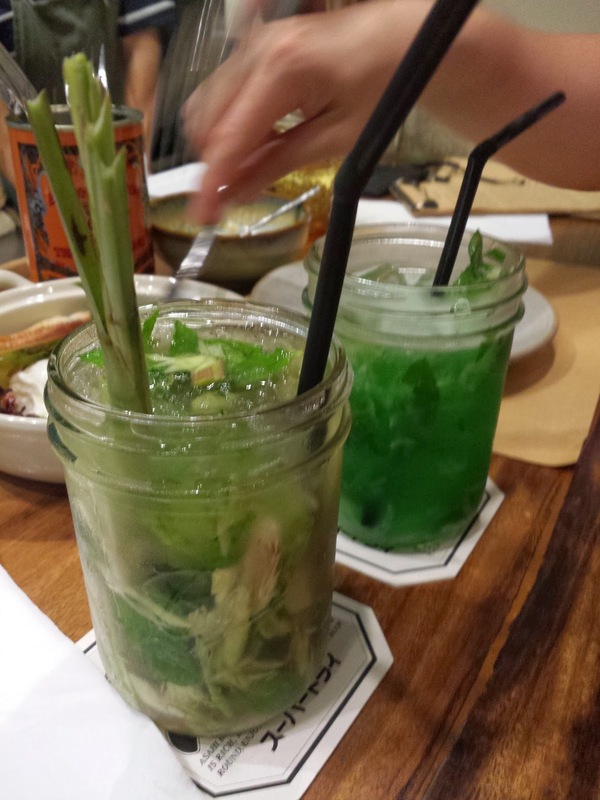 Both were served in mason jars and were very good. The first was a tirmiso-like dessert, where the chef used miso shiro in the dessert to make a savoury-sweet tiramisu and had milo on the top instead of cocoa. It was excellent and not sweet but I have to say that it wasn't hugely different from a regular tiramisu, except it was more mellow and yes, savoury. Not as savoury as I expected when I ordered it, which I guess is good, although I would have been interested to taste miso. The cheesecake was more conventional but with a gorgeous almond, macadamia nut topping that impressed even our dessert-loving trio. One criticism I've heard about Morsels, is that while the food is good and unique, people felt they weren't full after an expensive meal. The dishes ranged in price depending on the cost of the ingredients. The hamachi was $15 but the Burrata was $25. It depends on how many dishes you order, we were all very full but you would perhaps spend $100/person at dinner before drinks, so it may not be the most suitable place for a family. That being said, I don't think the prices of places like Esquina or Artichoke are any lower. I thought the fascinating mix of Brian and Petrina, his more free-wheeling ways and her clear discipline and attention to detail, which is required to keep time and bring so many plates out hot to the tables, is really something unusual for the Singapore food scene and in a way, cannot be done outside of a small, intimate place and at this sort of price point. 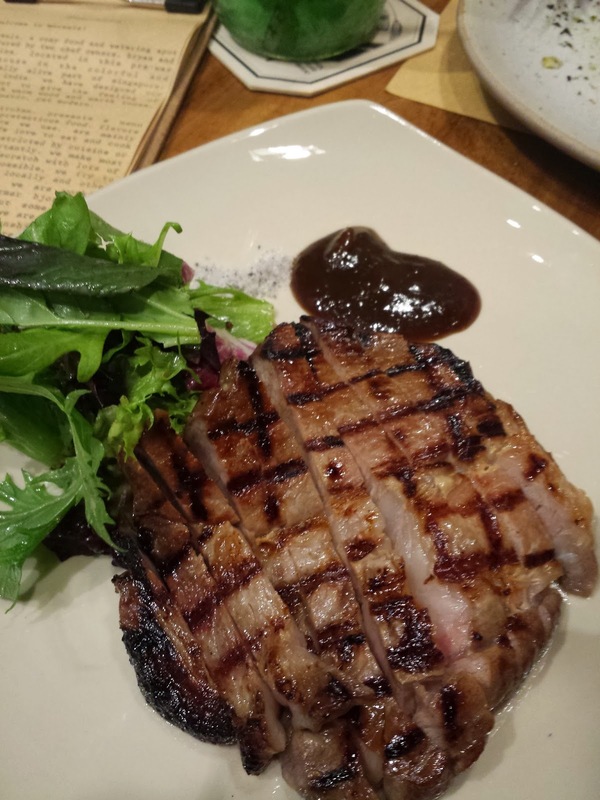 I really liked that the place was warm and friendly, as opposed to coldly commercial, which can be the case at a lot of the celebrity-chef offshoot restaurants and that the food was inventive and well-executed, I would definitely bring friends for a good night out.